Before I became the self-made man I am today, ahem, I'd amble into Carr Street of a Saturday lunchtime and nip into the food section of the lamented Co-op department store. There, I'd treat myself to a top takeaway treat in the guise of a chilled Cornish pasty from Pork Farms, a brand for the people by the people. Good times. That industrial noise of which you're only dimly aware is the procession of progress in the pre-cooked pastry world. Ipswich, our great town, leads the way by offering not one but two proximate pasty emporia. 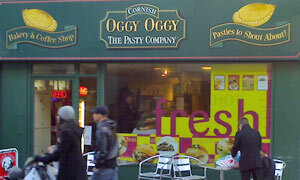 First up and at the Starbucks slash White Horse end of that self same Carr Street, spookily, is Oggy Oggy, The Pasty Company: note that definite article. "Pasties to Shout About! ", they claim. We'll be the judge of that, thanks. Tad chilly for the outside seats. In we step and it couldn't get more Cornish, what with the curry fillings and photos of St Michael's Mount, Clovelly, Adam & Joe, etc. Like Willy's And Milly's round the corner, they've squeezed in some tables though most trade is to-go. Bit poky but OK. No queueing up here, friends, it's waitress service and with a warm smile too. Baguettes, paninis -- pah -- I'll have the medium, no large, no giant Cornish pasty, thanks, plus a side order of beans. When in Rome. Soon, two ex-tin miners are carrying aloft my Pride Of Padstow to the table. Then I woke up and Andy had finally arrived. How was the grub? Just the job on an icy day, as was the mini cream tea that followed it, comprising scone plus jam plus your actual mini-catering clotted cream portion. All praise the pasty and associated food products. If it was a car -- VW Kombi. If they were passing by -- Rick Stein.